Large Cap Funds, as the name suggest invests a large portion of the fund in large companies with large market capitalization. These types of mutual funds are best buying bet in a volatile market. Most of the mutual fund advisor recommend large-cap mutual funds for moderate risk profile investors. As these types of fund invest in blue-chip large-cap companies, the risk factor associated with these funds are comparatively low. If you are looking for best large-cap mutual funds. Here is a list of best large-cap mutual funds for investment in 2018-2019. 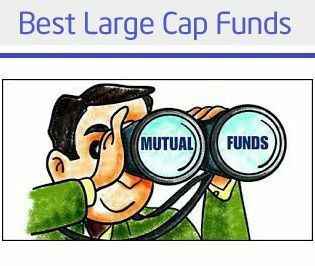 What is Large Cap Mutual Funds? Large Cap Mutual Funds invest in stocks of large companies. These large-cap companies are generally leaders in their field of business. They are likely to offer consistency and stability of returns over a period of time. These type of companies carry a strong performance record backed by good corporate-governance. These type of fund is likely to give lower return compared to mid-cap and small-cap funds, which are risky options for investment. Large-cap funds are moderate risk funds. However, an investor must consider various factors that impact the performance of the fund. Here are few important factors that you should consider while investing in large-cap funds. Past Performance of the Fund – A past performance of the fund is an important factor while investing in any fund. One must consider fund which gave consistent performance in both bullish and bearish market condition. A reputation of Fund house and the experience of fund manager – Another important factor for consideration is the reputation of the fund house. You should shortlist fund from the reputed fund house. The fund manager qualification, experience, and credential for handling large fund is another factor for consideration. Expense Ratio – Expense ratio is another important factor of consideration. Expense ratio impacts directly on the performance of the fund. Lower the expense ratio better is the performance of the fund. Financial Ratio – As an investor, you should also consider evaluating financial ratios of the fund. Sharpe Ratio – Sharp Ratio indicates how much returns can a fund generate with additional risk. In other words, it measures adjusted risk-return of the fund. Alpha – Alpha shows what is the ability of the manager to reap profits from the benchmark movements. Higher the alpha better is fund. Standard Deviation – Standard deviation is price range. It indicates volatility of fund returns. Mutual Fund Rating – Another important factor to consider is Mutual Fund Rating. A rating is perspective of other experts such as CRISIL, Value Research. This rating provides clues about investment. Regular or Direct Fund – Direct funds are likely to provide more return compared to regular fund. One should select direct fund over regular fund for investment. Based on the performance of large-cap funds and various other factors described above 3 Best Large Cap Mutual Funds in India for 2018-19 are given below. Kotak Select Focus fund is one of the trusted and popular large-cap fund. A fund size of this fund is 19000 Cr. This fund has given 20% annualized returns in last 5 years and 13% annualized returns in last 3 years. This fund has beaten benchmark index and given very good consistent returns. This fund invests in large-cap blue chip companies such as Maruti Suzuki, L&T, Infosys, HDFC, Reliance etc. It is five stars rated fund and good for investment for long term. Mirae Asset India Equity Fund is another best large-cap mutual fund for the investment. The main objective of this fund is to provide long-term capital appreciation by investing in the equity market. This fund has generated 19.5% annualized returns in last 5 years and 13% annualized return in last 3 years. It has outperformed its benchmark and most of its peers in every single year since its inception. It is five stars rated fund. SBI Bluechip fund is one of the best large-cap mutual funds. This fund has managed to beat benchmark in each of last five years. This fund has generated 17% annualized returns in last 5 years and 10.8% annualized return in last 3 years. Largest holding of this fund is in banking and finance sector. Apart from that this fund also invests in good stocks such as ITC, M&M, Nestle etc. A summary of Top 3 Best Large Cap Mutual Funds is given below. Top 3 Large-Cap Mutual Funds are indicative and selected based on current returns (as of May,19,2018). You should carry out your independent research before investing in any of the mutual funds. Who should consider Large Cap Mutual Funds for Investment? Large Cap fund is the best choice for moderate risk investors. These type of funds are likely to give average return irrespective of market conditions. If your investment goals and risk profile are matching with the large-cap fund you can invest in the large-cap fund. A first-time mutual fund investor can also invest in large-cap funds. These funds play important role in bringing stability and steady return to your investment portfolio. However, you cannot expect very high returns from this fund. What is your take on the large-cap mutual funds mention above? Do share your queries and comments. Subscribe to our blog and get latest updates in your inbox.